What is Paddle Golden Gate? The mission of Paddle Golden Gate is simple; to offer high-end professional paddlesports instruction and a quality event experience in a truly unique location. This remarkable venue provides a challenging coastal environment with strong currents and powerful swells for advanced skills training alongside protected water appropriate for novice and intermediate paddlers to develop their skills. With a focus on skills training, this unique event offers participants the opportunity to paddle with some of the world’s best instructors and athletes, in one of the finest teaching locations in the world. 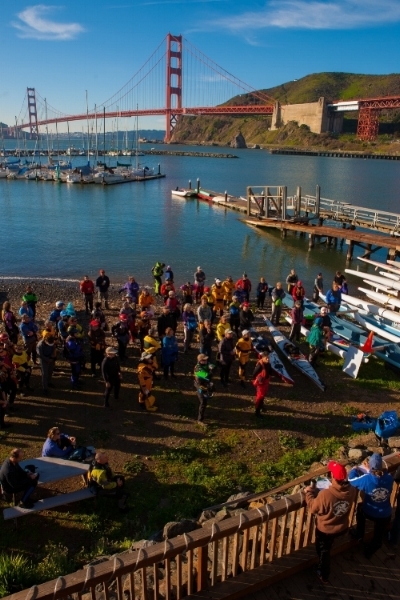 A similar event known as the Golden Gate Sea Kayak Symposium (GGSKS), was created by Sean Morley, Jennifer Kleck and Matt Palmariello in January 2009. After the first year, GGSKS was given to the California Paddle Sports Council, a non-profit paddlesports advocate organization in Northern California. With the cancellation of the event and dissolution of the California Paddlesports Council in 2015, there was an opportunity to review every aspect of the event and thus Paddle Golden Gate (PGG) was born. A new name for a new era – Paddle Golden Gate better reflects the diversity of paddlesports in the Bay Area and the event is owned and organized by California Canoe & Kayak, the premier paddlesports retailer and instructional provider for over 40 years. PGG instructors are some of the biggest names in paddlesports from as far afield as Europe and South Africa. We chose this time of year because much of North America remains frozen while San Francisco can experience summer-like weather making it the perfect paddling destination! Whilst the event has been designed to appeal to visiting paddlers, local paddlers can benefit from the event as well with the opportunity to receive coaching from some of the best in the business and share ideas and make connections with people from across North America. Our goal is simple – we want you to leave inspired to paddle even more! Paddle Golden Gate is a three-day event with classes on Friday, Saturday and Sunday. The event operates a simple format offering full-day and some half-day courses to maximize learning potential and give the best value to participants. But the magic really happens off the water with social and entertainment events where participants rub shoulders with some of the biggest names in paddlesports. To embrace the full flavor of the event, participants are encouraged to stay at the Marin Headlands Hostel. Most of PGG’s coaches and instructors will be staying at the hostel and the sense of community is what makes this event so special. Evening entertainment will include informal social gatherings and keynote speakers presenting fascinating accounts of unique journeys by paddle power. Sign up for our newsletter to be kept up to date on the details as we pull the event together. Boats and gear rentals are available through California Canoe & Kayak. The venue and the hostel are accessible using public transport from the San Francisco and other Bay Area airports. In addition to the main three day event, there will likely be ACA and BC Trainings and Assessments being run consecutively with the event. Please stand by for details. Sign up to receive Paddle Golden Gate news and updates.